Bobby Hafemann took his life because he became addicted to electronic gambling machines. Who was the primary sponsor and beneficiary of the machines that led to his death? His own state government. Bobby’s sister, Ronda Hatefi, has organized an annual day in her state for the last twenty years to remember her brother and all of those citizens who have been damaged by government-sponsored gambling. To highlight the voices and stories of the millions of Americans like Bobby Hafemann, we are organizing the first-ever National Day of Action Against Predatory Gambling on Sat. Sept. 26 and Sun. Sept. 27. We will publicize how this public policy is dishonest, financially damaging to citizens and contributing to the unfairness and inequality in our country. Through our creative actions we’ll call attention to the needed shift away from government’s dishonest, predatory and failed experiment with gambling toward a fairer, healthier and more hopeful vision of America’s future. 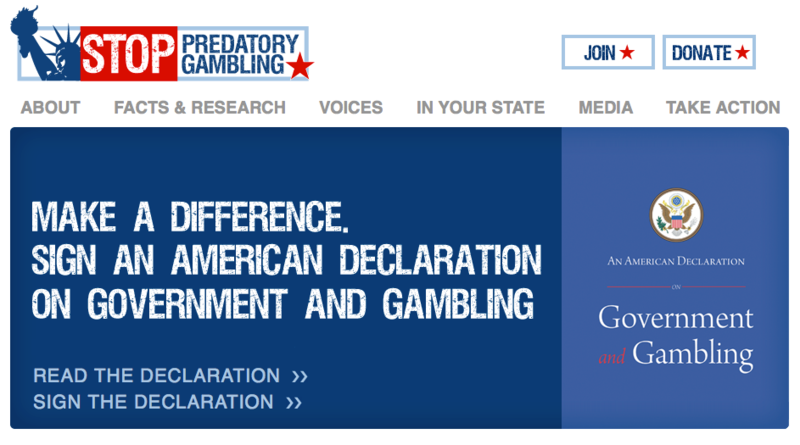 Our common message: Predatory gambling cheats and harms everyone–even those who don’t gamble. We’ve all seen the feel-good proclamations by public officials and their token efforts to stop the damage with their 1-800 phone numbers and their virtually meaningless “self-exclusion” policies. But they still keep the machines running, designing them to be even more financially damaging and addictive, while continuing to push more forms of predatory gambling onto citizens and making it even more accessible. This is why we have to confront and protest. There will be at least 100 separate actions across the United States.The “action” can be anything you (or your group) want it to be and the list of ideas is limitless. The action should reflect our common message. Some possibilities include: doing a visibility with homemade signs in your community, organizing a prayer vigil, participating in a “Freedom Players” event at a regional casino (or at a local restaurant/tavern with video gambling machines) and so on. In the days ahead, we invite you to email your ideas for actions to us and we’ll put them together on one list to send out to everyone. It will help all of us to think of possibilities for our own communities. This entry was posted in Uncategorized and tagged Casino, CCACG, Gambling, Newport Grand, Rhode Island, Stop Predatory Gambling, Twin River by NoCasinoRI Webmaster. Bookmark the permalink.